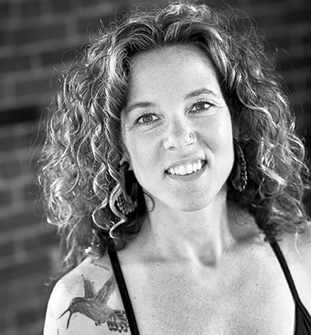 Melanie Green is a yoga teacher, mother and co-director of the Berkeley Yoga Center. She has been practicing yoga for over 20 years and teaching since late 1999. Melanie makes yoga accessible to all. While encouraging students to focus on their breath, drishti, and sensations, she teaches her students to deepen their practice as they honor their bodies. She values the spiritual aspects of yoga integrated with the asanas. Melanie focuses as much on the profound inner lessons of yoga: attention to the breath, letting go of thoughts and ego and perseverance through practice, as she does on the physicality of the poses. This process has been informed by Melanie's own experience with scoliosis - which is how her journey of yoga began. In each class, the student is invited to let go and have fun. Melanie's yoga background includes extensive study in Ashtanga. She has also trained in Iyengar, Pre/Postnatal and Vipassana Meditation. Her daily practice informs her teaching and gives her an abundance of experience from which to teach others. Melanie always finds ways to integrate lessons from her own yoga practice into her daily life with her children and wife. Melanie has also been volunteering her time for the last decade teaching yoga, but currently her volunteer work takes her to the Edible School Yard in Berkeley and the front desk at Berkeley High. Melanie still teaches yoga to children; currently she teaches yoga at various local Berkeley Public Elementary Schools through grants and parent support. In addition to her regularly scheduled classes, Melanie also offers private yoga instruction, wellness coaching and special weekend workshops. These appointments are available to any student who is interested in receiving one on one instruction in yoga, nutrition, wellness or cleansing. Private yoga instruction is quite helpful in assisting students who want to deepen their existing yoga practice or for beginning students who want to jump start their yoga practice.